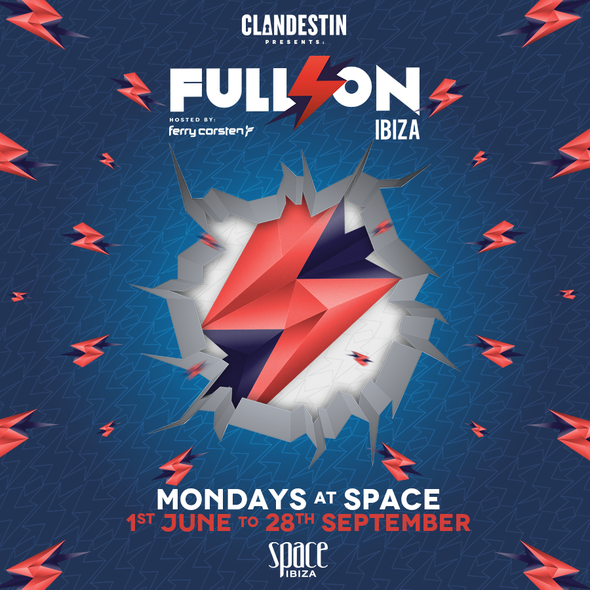 Clandestin Presents Full On Ibiza renews its residency at Space Ibiza for the 2015 season. After the success of its first year, Ferry Corsten’s night is back to position itself as one of the leading choice among lovers of trance and progressive house. The party will be held every Monday from 1 June to 28 September for a total of 18 events. Instead of Fridays, Clandestin Presents Full On Ibiza will now occupy Monday nights. The selection of artists will remain the essence of the party with many of the DJs that passed through last season back again. These include Adrian Lux, Alex Kunnari, Aly & Fila, Audien, Bassjackers, Cosmic Gate, Jacob van Hage, John O Callaghan, Marco V, Michael Woods, New World Punx, Orjan Nilsen, Thomas Newson and of course, Ferry Corsten, who remains the host and headliner of most of the nights. New artists like Dimension, Emma Hewitt Live, Henrik B., Lucky Charms, Mark Sherry and Vicetone are joining this year’s lineup, with more to be confirmed. Since he established Full On in 2007, Ferry Corsten has traveled the world giving out his personal project that now has a fixed stop in Ibiza. The concept does not change, the themes and aesthetics of the party remain, like the B2B sessions between him and his guests.